YFPA believes in developing relationships. Everyday we strive to connect, educate, and serve because we want to engage and empower young Filipino professionals. 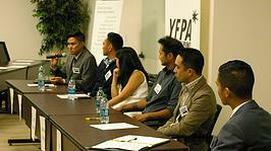 Your Filipino Professionals Association (YFPA), a 501(c)(3) nonprofit organization, was launched in 2002 as a collaborative forum for Filipino-American professionals in the San Francisco Bay Area to connect, collaborate and support professional networking, educational and community service activities. YFPA is led by a unique and 100% volunteer-based Board of Directors. Our vision is to be the main networking resource for Filipino professionals in San Francisco Bay Area. We are constantly building relationships with community partners so that we can continue to connect, educate, and serve to build a strong Filipino community.